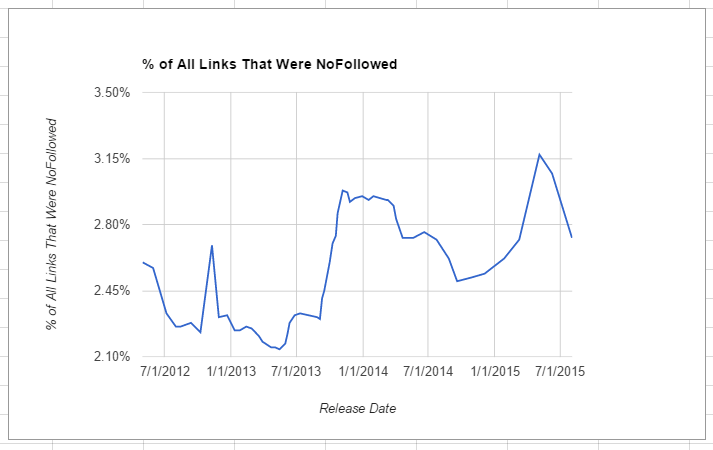 Do SEOs and Marketers Take NoFollow Links Into Account? Last week we received a tweet asking about nofollow links for SEO. My response in the moment was “I don’t remember the last time I thought about follow/nofollow when it comes to link building” but then I realized that since I haven’t (really) been building links in the traditional way for a couple of years now, I don’t know what marketers think about nofollow links these days. If it’s a high authority site, I don’t care if it’s followed or not. So what can we conclude? 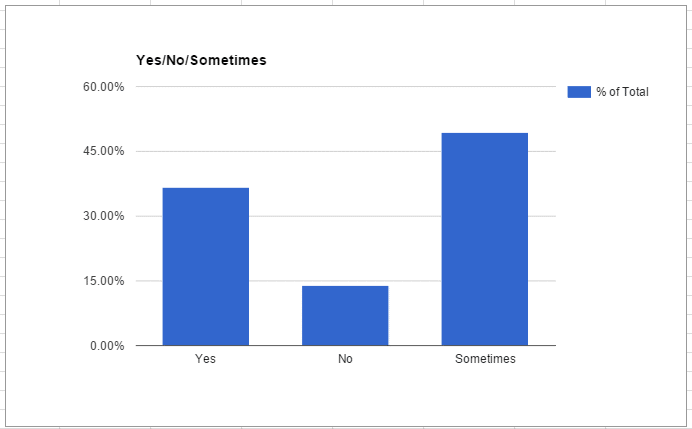 Well, since we do not have year over year data we cannot draw any date-driven trends, but given that my site’s audience is primarily SEOs (who may be branching out into other areas as well), it surprised me a bit to see so many saying “sometimes” instead of just a blanket “yes”, which I expected more of. Are the trends changing? Because there are a number of non-professional SEOs reading here, let’s briefly explore the history of the nofollow link, why it came to be, and then an argument for why I believe nofollow matters so much less now and why it shouldn’t be an issue if you are doing great holistic marketing (instead of just SEO tricks). How Is A Link Structured? That rel=”nofollow” addition within the opening <a href=””> section is what stops link equity from passing. Nofollow has been a part of the W3C guidelines for quite some time, but previous to 2005 it seems that directive was ignored in large part by search engines, especially search engines like Google that are based on the link graph of the web. At the beginning of 2005, however, Google announced that it would no longer pass PageRank (I call it that here because it was called that then) or in modern terms “link equity” through nofollow links because comment spam was becoming so prevalent and being used to manipulate the link graph unfairly towards spammers. Remember the days of searching for “nike shoes” online and finding a lot of really bad sites that were not selling official Nikes? Welcome to the unnatural link graph. Over time, the nofollow link has become used more often by bloggers because they were tired of being targeted by automated comment spam software sniffing for following links to once again manipulate the link graph in favor of (likely not-deserving) sites. Previous to 2009, a very effective tactic in on-page SEO was that of “pagerank sculpting”, where webmasters would assign the nofollow attribute to internal links so that their pages passed more link equity to the pages linked via the nofollow. In this model, if the page had a score of 50 and there were 10 links on the page, but 5 were nofollowed, the 5 pages linked without a nofollow got 10 passed to it. This seems like a small change, but in plain speak this is what it did. If our example page had a score of 50, and 5 were nofollowed, the 5 pages linked without a nofollow only receive 5 now instead of 10. This was a big change! So as you can see, it’s not really worth it to try to sculpt anymore because all you are effectively doing is starving the ones you link to with a nofollow, but you are not stopping the search engines from crawling those pages. PageRank sculpting was a tactic used by webmasters to help their pages rank higher, but it is not the reason nofollow was originally created and is now followed by search engines. Basically, the nofollow was meant to say whether or not a link from your site to another should count as a “vote” for that other site. Because spammers were using followed links in comments as a way to unnaturally build links, a lot of content management systems (CMSs) like WordPress implemented nofollow as a standard in all comments, or at least allow for it if you so desire. The ongoing issue with nofollow on the web is that many sites, especially large news sites, nofollow every external link by default. While this is frustrating for many SEOs who want that link, the survey results show that a lot of SEOs/marketers will take that link regardless if it’s on a high authority site that will likely pass qualified referral traffic for years to come. 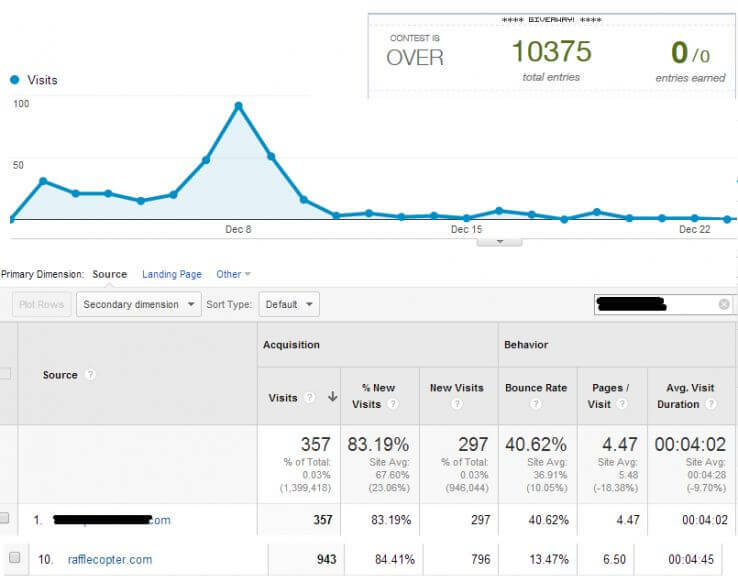 I’ve seen sites with nofollowed links from 2011 that still drive a few thousand visits a month. That’s power! And I’d suspect that these kinds of links are probably still counted as a vote by the search engines. One final interesting data point around the nofollow is the increase in its usage over the years. To get this graph and numbers, I went back and pulled the % of total links that are nofollowed as crawled by Moz for Mozscape from their API Release History. For the percentage of nofollow links that are external, one can see a general trend that the percentage is decreasing over the years, which is surprising to me. The best way I can think to explain this is that more and more sites are realizing that they should follow legitimate editorial links instead of nofollowing them to “save” link equity. And finally, the percentage of nofollowed links that are internal has risen over time as the % of external nofollowed has dropped. This makes sense, as these are based off of a complete 100%. The question remains, which is causing which? 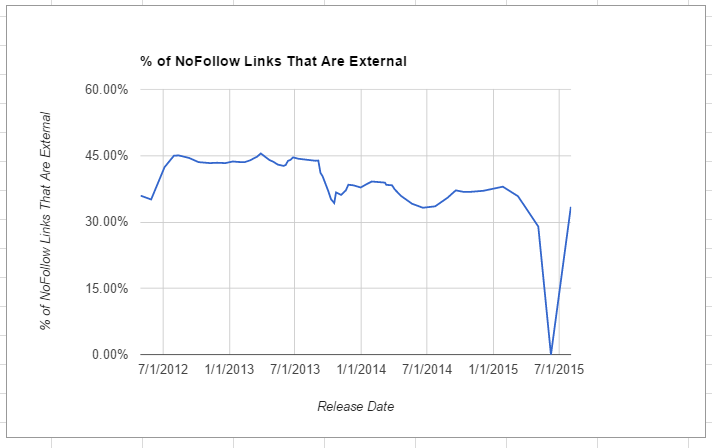 Are internal nofollow links in total going up, or is their relative share dropping as more external links are followed? To answer that we would need to know the raw counts, but the general trend holds. So what are your thoughts? 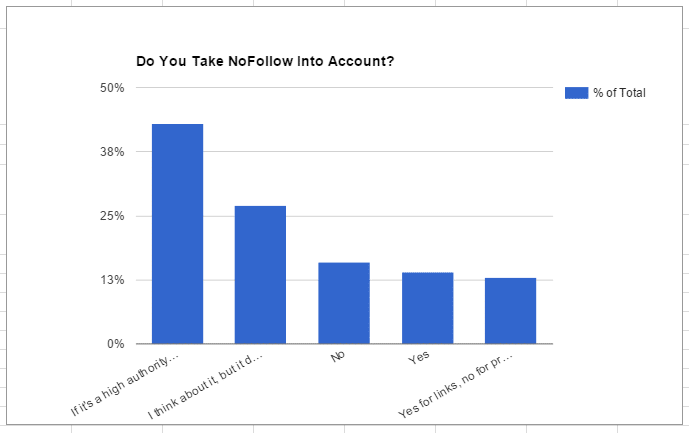 Do you take nofollow into account? 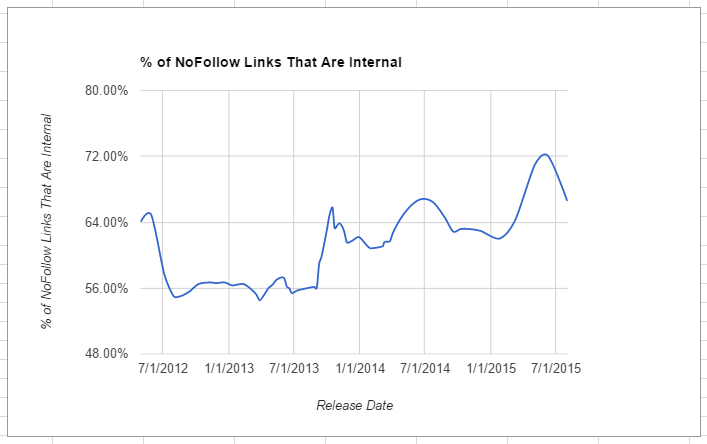 What could explain the rise in % of nofollow links that are internal? Leave a comment! 1) id suggest that a lot of folks have been looking to consolidate internal link equity – if you think about it you now MUST rely more an your site architecture to distribute link weight than previously (you could just spam it by sticking links at your important pages without having to change the architecture very much) now you need to prioritise (even more so after hummingbird consolidated queries into topics meaning that a more is less approach generally pays off ) so have some folks been getting no follow happy (not by PR sculpturing) but by actually removing/consolidating lots of pages and no following admin pages (tried this and it worked a few times). Maybe that affected the internal ratio? 2) Newspapers and top internet news sites/niche sites have employed lots of SEO’s – this means that many of them may have a cautionary no follow editorial policy designed to make sure G doesn’t come knocking for making editorial advertorial either by accident or intent. That might explain external thing? Lee – interesting points here, and I think they are very valid theories. The consolidation and removing of pages/links onsite could be a big part of 1) for sure. 2) is a bit more confusing for me. I get the editorial/advertorial thing, but my guess is that the vast majority of links online are not from big news sites. So I’m not sure how to explain it, if the raw numbers even support the percentage differences we see. This looks natural and also increase brand mentions and link popularity. Now I can see this page soon in my search console linked sites. I have tested it. no follow links gets very less rank like 1/10 of page.